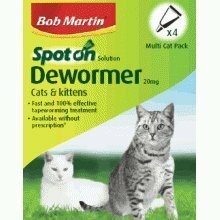 Bob Martin Spot On Dewormer for Cats and Kittens over 1kg, is a fast and effective treatment for tapeworm. 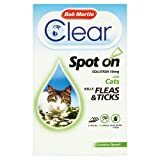 One spot on treats Cats and Kittens from 1kg in weight. This pack contains 4 treatments. IMPORTANT: Use correctly to safeguard the health of you and your pet. 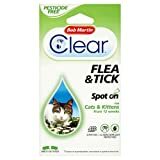 Read the Product Information on pack or enclosed leaflet carefully before use.